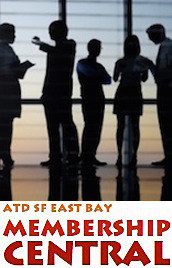 ATD SF East Bay - REBOOT YOUR BUSINESS / REBOOT YOUR CAREER: GET FOCUSED AND ENERGIZE YOUR PROFESSIONAL GOALS! REBOOT YOUR BUSINESS / REBOOT YOUR CAREER: GET FOCUSED AND ENERGIZE YOUR PROFESSIONAL GOALS! What is the NorCal Consortium? MT. DIABLO ASTD is now part of "The NorCal Consortium" of professional development associations that in addition to the Mt. Diablo ASTD, includes the Golden Gate Chapter, the Bay Area Human Resources Executive Councel (BAHREC), SF ICF (International Coach Federations), National Speaker's Association (NSA) and the South Bay ODN (Organizational Development Network). Meet with colleagues in the new NorCal Consortium and work together to set your goals in motion. Every year we set new intentions and goals for our business or career. For a while we remain engaged and in action, and then, inevitably, we start to face familiar challenges. I'm on information overload, how do I stay sane? How do I facilitate and maintain the client relationship? We know we're not alone--if we are strong in one area, someone else is strong in another. How do we find others in our profession who complement our strengths, and who we can help in return? Come together with your colleagues to inspire each other and build a smart, supportive community. You will leave feeling energized and prepared for the challenges ahead--with great new relationships to help throughout the year. Please go to the registration page here. Sorry, the Consortium cannot accept checks at this time. Thank you for understanding. We are kicking off our new, exciting partnership with a network of local like-minded professional development organizations, coming together to serve our membership communities through broader networking opportunities and more impactful events. What are the new Consortium's features?